« Back in the kitchen. Saturday we ate as many pears as we could and cooked up a big batch of Bolognese with the tomatoes and used the carrots and onions in chicken stock. Sunday was pizza and salad for lunch, and pasta fagioli for dinner with a delicious side of braising greens. Monday I made Soto Ayam (more on that later) which used some cilantro and the chicken stock. Tuesday dinner never happened. sigh. Wednesday: orrecchiette with sausage and broccoli rabe. 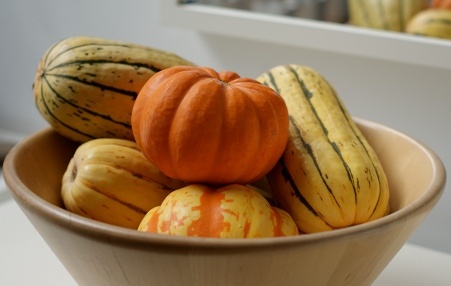 Delicata squash – we have been collecting these over the past few weeks and are looking for something to make with them – help! With our abundance of tomatoes, we decided to take my friend Karyn’s advice and stuff them. But with what? After looking around online, I had mostly found unappetizing recipes for stuffing tomatoes (tuna and goat cheese anyone? 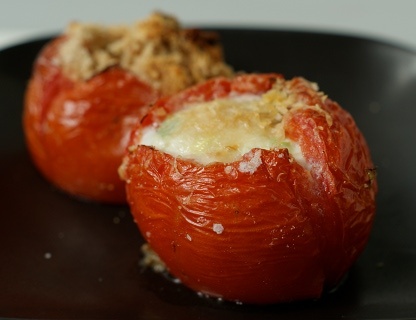 ), I was inspired by this recipe which called for baking eggs inside of a tomato (genius!) from the blog, We are Not Martha, which was a perfect Sunday breakfast. This entry was posted on October 10, 2010, 2:46 pm and is filed under CSA Challenge. You can follow any responses to this entry through RSS 2.0. You can leave a response, or trackback from your own site. I have never seen an egg inside of a tomato but I love the idea. As for those squash, can you stuff them with rice and nuts and cranberries and bake them?